As in slice down the middle and have a sandwich with a sunshine yellow ball of soft carbohydrate goodness. I guess I may as well play with my food while I am at it. I've been having problems with finding just the right roll, and I realize that bread is pretty common, but excellent bread is rare. There are a few very good shops here in South Florida, one on Commercial comes to mind called the German Bread Haus, but that means I'd have to get in the car and so forth. Like I said basic and good. I had trouble finding a decent Egg Bagel at the same time. Ok, it's not the Bagel Place in Cherry Hill with their chewy goodness - and I understand it isn't even what I remember it from 2006 and has been sold, but I have been having Lenders Frozen Egg Bagels until Publix stopped carrying them in the chain at least in this Region. Whatever you define a region as. I also wanted a "right sized" bagel - 150 calories plus or minus 10, not the more generous ones you find when you're out. Look at the bag on those - 320 calories. No wonder why people are fat. So bake them yourself. I managed to size them correctly and hit right at 150 calories. The ingredients are at the bottom but I did manage to tweak the recipe to get them this way. First, I wanted rolls, not bagels in this case. No Egg Wash for Shiny Crust. Personal preference. If you want a shiny crust, brush them with egg whites. Separate an egg and brush with pastry brush. I didn't really want that this time. Maybe next time. We'll see how the mood is. Second, I was going for a set size. Sandwich sized, not a loaf. I cut the dough into 9 equal parts. Weigh the resultant dough, then get the calculator out and divide by 9. Works best when you use Metric since for some weird coincidence these rolls were exactly 78 grams. The dough ran at 702 grams. Just easier to do the math that way since that works out to be 2.78 ounces per roll. I didn't think so. Use a calculator it's easier. Third I wanted big poofy fluffy rolls. I added extra Yeast. USE 2 TABLESPOONS OF DRY YEAST. Fourth I allowed 4 hours to rise. Just felt better that way and I tossed them in the oven when they looked happy. 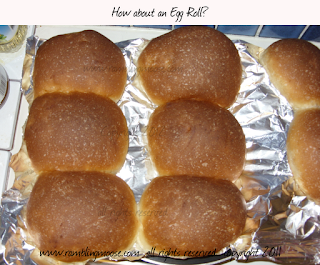 I could have stopped earlier and had denser rolls and they just didn't seem to be getting bigger at that time. 1 Package Yeast - I used 2 Tablespoons and got what you see above. 1 Tablespoon light tasting Oil. I used Safflower for heart healthy. Mix until you get a nice dough. Bake at 450 for 8 to 12 or until done like you like them. I used the Bread Machine to mix the dough but you could just as easily use a mixer with a dough hook or if you're really feeling like a workout, in a big bowl. It made for a sticky dough. Bake at 450 for 8 to 12 minutes. The picture was the first batch baked at 450F at 11 minutes and my oven is notoriously inaccurate. The next batch was at 9 minutes, the third was at 8 and I couldn't tell the difference in the result. If your oven is accurate let me know, I'll come over and use yours.